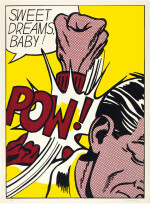 Roy Lichtenstein, Sweet Dreams Baby! from 11 Pop Artists, Volume III (1965), screenprint, image 35 1/2 x 25 1/2 inches, sheet 37 1/2 x 27 1/2 inches. Christie’s Images Ltd. 2015. 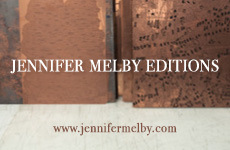 Phillips’ “Evening & Day Editions” sale on 26 October was the first of the New York fall print auctions. A good-sized live audience paired with substantial phone and online bidding led to strong numbers and an 85% sell-through rate by lot. One disappointment was Jenny Holzer’s Selections from Survival: You Are So Complex that You Don’t Always Respond to Danger (2006) passed with no interest (est. $60,000–90,000). This may have been due to the lot being sold with the contingency that it would not be resold for 10 years (the seller was the non-profit gallery Artists Space), and as the auctioneer concluded after the hammer, “ten years is a long time.” Sales of Robert Longo works were uneven, with lithographs Joanna from Men in the Cities (1983) and Jules (1982–83) selling for $22,500 (est. $15,000–25,000) and $8,125 (est. $4,000–6,000) respectively, but two more recent archival pigment prints, Ivy Mike (2010) and Angel’s Wing (2005), passing with little interest. Two surprise hits were Dan Flavin’s (for Gina and DeWain) 1 and (for Gina and DeWain) 2 (1987) for $6,875 (est. $2,000–3,000) and Pierre Soulages’s Etching Xa (Eau-forte Xa) (1957) for $10,000 (est. $2,500–3,500). Christies’ began their fall prints andeditions lineup with an evening sale of Miró and Picasso multiples on 27 October. Even with the evening time-slot, however, few live bidders showed up. Nonetheless, the majority of the lots sold through (82%), many to phone and internet bids. 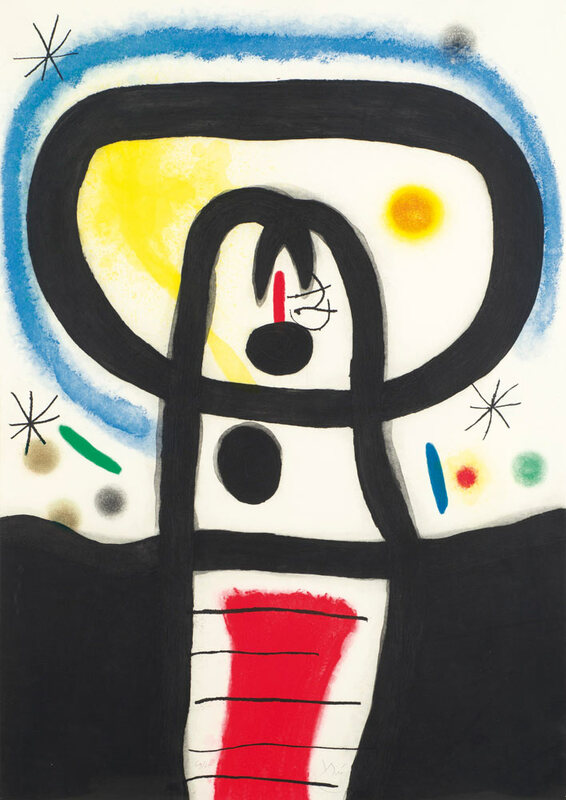 There were no surprises among the Miró lots; top sellers included La Somnambule (1974) for $68,750 (est. $40,000–60,000) and Equinoxe (1967) (the catalogue cover image) for $87,500 (est. $60,000–80,000). Picasso sales were also steady; the famous Minotaure aveugle guidé par Marie-Thérèse au pigeon dans une nuit étoilée from La Suite Vollard (1934) sold slightly above estimate to a phone bidder at $137,000 (est. $70,000–$100,000). Joan Miro, Equinoxe (1967), etching with aquatint and carborundum in colors, 41 x 29 inches. Christie’s Images Ltd. 2015. 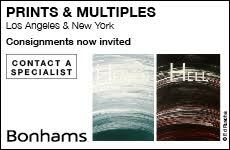 The two day sales on the 28th day saw solid sales for both modern and contemporary works. 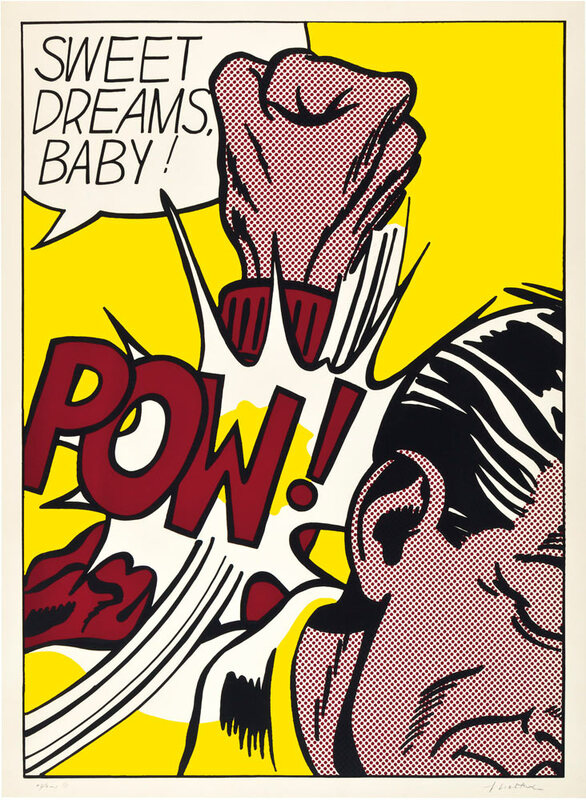 Lichtenstein proved to be the star—his Sweet Dreams, Baby! from 11 Pop Artists, Volume III (1965) incited a battle between multiple live and phone bidders before selling for $269,000, setting a new auction record for the print and more than doubling the $70,000–90,000 estimate. The lion’s share of Lichtenstein prints sold above or near the high estimate, with several doubling or tripling estimates: As I Open Fire (1966), three unsigned offset lithographs, for $6,250 (est. $1,000–1,500); Crak! (1964) for $67,500 (est. $20,000–30,000) and Real Estate (1969) for $20,000 (est. $7,000–9,000). Motherwell and Fontana also fetched high bids, with Motherwell’s Octavio Paz, Three Poems, The Limited Editions Club, New York (1988) going for $40,000 (est. $10,000–15,000) and Fontana’s Concetto Spaziale (1968) selling at $13,750 (est. $4,000–6,000). Matisse’s Jazz (1947) jumped past its $250,000–350,000 estimate to sell for $425,000, though Warhol’s Mao portfolio (1972) sold below its bottom estimate at $593,000. 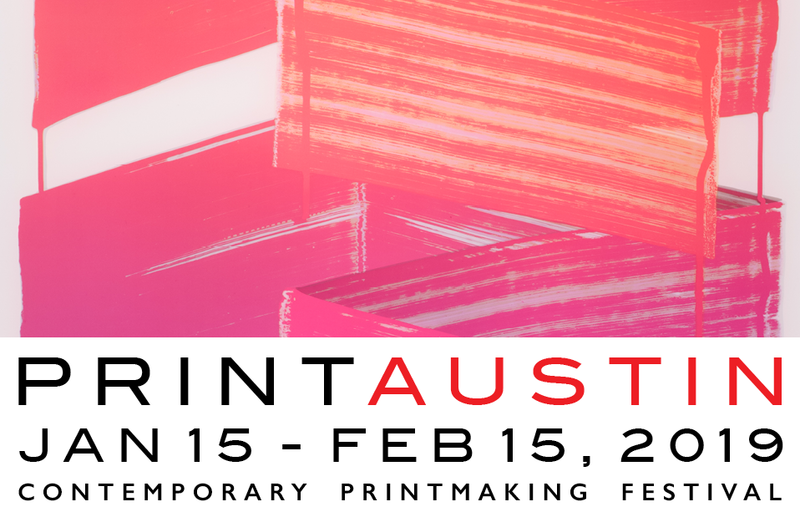 Swann Auction Galleries held their fall print sales on 3–4 November. Although certain lots and artists sold quite well, and multiple auction records were set, the overall sell-through rate by lot was only 64%. The sales began with a selection of American prints from a private collection (218 lots). Works by Gustave Baumann were in demand, with almost all selling within or above estimate. Exceptional lots included Summer Shadows (1917) for $42,500 (est. $7,000–10,000), an artist record, Grandma Battins Garden (Hoosier Garden) (1926) for $21,250 (est. $10,000–15,000) and Superstition Mountain (1949) for $23,750 (est. $6,000–9,000). A drypoint by Martin Lewis, Wet Night, Route 6 (1933) also set an artist record at $72,500 (est. 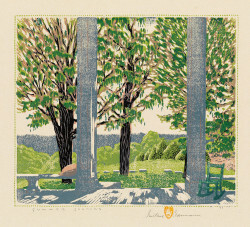 $20,000–30,000), but six other Lewis prints sold at the low end of their estimate or passed through altogether. Works by Thomas Hart Benton sold well, several above estimate, with the standout being The Race (1942), at $37,500 (est. $15,000–20,000). In the two-part “Old Master Through Modern” sale the following day Dürer sales were mixed, with more than one-third of lots passing through. The Bath House (ca. 1498, a Meder c-d impression) and Joachim and the Angel (1504) both performed better than expected, at $9,375 (est. $4,000–6,000) and $10,625 (est. $3,000–4,000) respectively. Two uncommon “Knot” woodcuts, Knot with Oblong Shield (1505–7) and Knot with a White Disk (1505–7), set auction records, selling to the same phone bidder for $12,500 each (est. $5,000–8,000). Sales of Rembrandt prints were steadier if not spectacular, although Old Man in Meditation, Leaning on a Book (ca. 1645) more than doubled estimate and set an auction record at $42,000 (est. $15,000–20,000) and The Boat House (1645) sailed past estimate and also set a record at $42,500 (est. $15,000–20,000). Sales of Piranesi prints were very sound, with all works selling, the large majority at or above estimate. In the Modern section, sales of works by favorites Picasso, Toulouse-Lautrec and Matisse were fairly strong and Matisse’s linocut Nu au Bracelet (1940) set a record at $20,000 (est. $8,000–12,000). 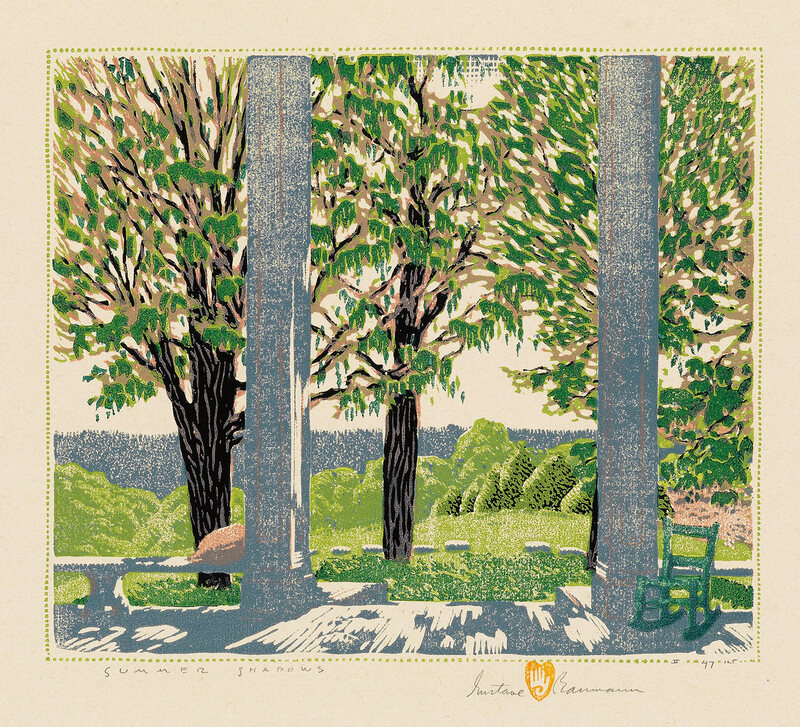 Gustave Baumann, Summer Shadows (1917), color woodcut, 24.5 x 28.8 cm. Image courtesy of Swann Auction Galleries. Swann’s contemporary sale on 12 November (which also included some drawings and paintings) enjoyed a higher sell-through rate (78% by lot). 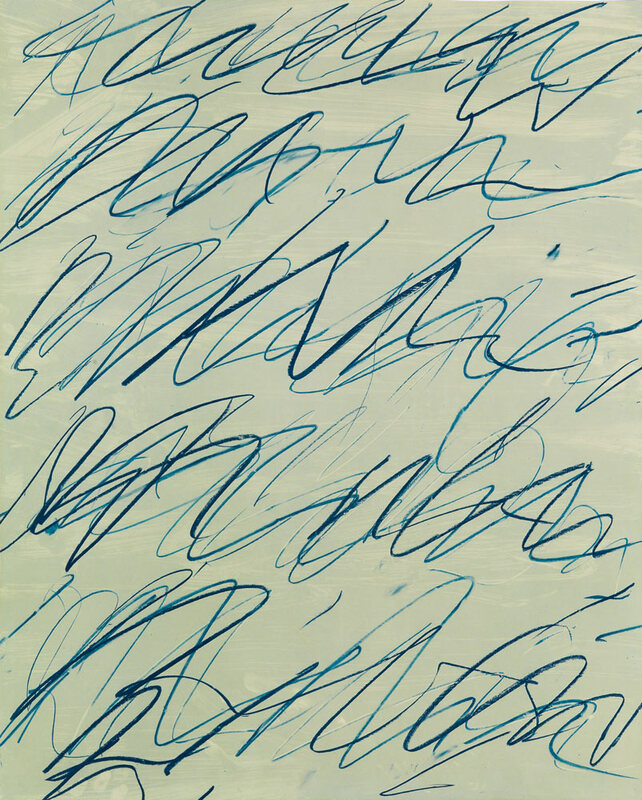 Twombly’s Roman Notes III (1970), featured on the cover of the catalogue, was the top seller, setting an auction record at $50,000 (est. $35,000–50,000). Works by Motherwell sold well and prints by Calder and Lichtenstein showed solid results, with the majority selling within or above estimate. Doyle’s “Prints & Multiples” sale on 27 October brought spirited bidding from a large live audience as well as phone and online buyers, resulting in an impressive sell-through rate of 93% by lot. Top lots included a unique trial proof of Warhol’s Alexander the Great (1982) for $106,250 (est. $40,000–60,000), a new auction record; Lichtenstein’s Crying Girl (1963) for $53,125 (est. $20,000–30,000); and Benton Spruance’s Traffic Control (1963) for $34,375 (est. $10,000–15,000). All the Miró lots found buyers, and La Calebasse (1969) and Manoletina (1969) both surpassed estimate at $43,750 (est. $20,000–30,000) and $23,750 (est. $12,000–18,000) respectively. Two works by Sonia Delaunay-Terk more than doubled their estimates: Ses Peintures, Ses Objets, Ses Tissus Simultanes, Ses Modes (1925–26), a set of 20 pochoirs, sold for $5,000 (est. $1,000–1,500) and Composition (1960), a pair of etchings, sold for $3,438 (est. $1,000–1,500). Dan Flavin’s atypical drypoint set, Second Sails (to James Abbott McNeill Whistler) (1978) doubled its estimate at $5,313 (est. $1,500–2,500). And once again Pierre Soulages etchings did remarkably well: Eau Forte No 11 (Rivière 11) (1957) sold for $9,375 (est. $3,000–5,000) and Eau Forte No 13 (Rivière 13) (1957) for $10,625 (est. $2,500–3,500). 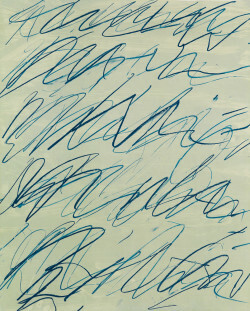 Cy Twombly, Roman Notes III (1970), offset color lithograph, 34 1/8 x 27 1/2 inches. Image courtesy of Swann Auction Galleries. Bonhams held their fall sale of modern and contemporary prints and multiples on 17 November. Despite a few strong sales, there was a definite lack of enthusiasm at the sale, with a sell-through late of less than 60% by lot. Miró and Picasso works had steady sales at expected prices—top lots included Picasso’s Pichet à glace (a 1952 earthenware pitcher) for $37,500 (est. 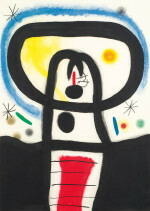 $30,000–40,000) and Miró’s La Femme Aux Bijoux (1968) for $20,000 (est. $15,000–20,000). Sales were more uneven in the contemporary section. The catalogue cover image, Warhol’s Alexander the Great (1982) garnered little interest and passed at $40,000 (est. $50,000–70,000). A few lots did manage to break the pattern, including Mel Ramos’s Leta and the Swan (1969) for (est. $6,000–8,000) for $17,500 and Motherwell’s Tobacco Roth-Handle (1975) for $4,750 (est. $2,000–3,000). Sotheby’s four-part sale on 23–24 November included more than 400 lots and saw moderate sales (72% sell-through) with a few notable surprises. Works by Matisse were strong early sellers, with all prints achieving or surpassing estimate. A complete set of the Jazz portfolio (1947) fetched an unprecedented $1,120,000 (est. $300,000–400,000). Sales of work by Munch, however, were disappointing: an extensively hand-colored Madonna lithograph (1895) falling short of estimate at $730,000 (est. $1,000,000–1,500,000) and two anticipated stars, Two Women on the Shore (1898) (est. $400,000–500,000) and Vampyr II (1902) (est. $250,000–350,000) failed to sell at all. hammer price and buyer’s premium.